A modern day Samuel Johnson or a blustering fool who has no internal filter? There are few figures in modern music as divisive as Kanye West, but fewer still who have contributed so much to popular culture. West comes across like some contemporary, Twitter-literate version of Sartre's famous Autodidact, a man on an endless but futile quest to know everything, devouring the modern world from A to Z. But where Sartre's creation is a self-deluding, vacuous dilettante West comes across as genuine, flawed, endearing: a man more than aware of his own foibles, constantly examining himself whilst throwing verbal barbs and bolts at those around him. By anyone's account, the last few years haven't been easy. There was a stage where West seemed all ready to implode, indulging in a very public self-flagellation stemming from the death of a beloved mother and the shattering of a bloated ego. Run-ins with Taylor Swift and George Bush made West persona non grata in some quarters, and the tepid reception afforded to the criminally underrated 808's & Heartbreak signalled for some the beginning of a terminal decline for a man once hailed as the saviour of hip-hop. 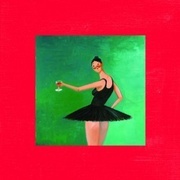 Stung by the criticism, and wanting to rehabilitate himself away from the searing public gaze, West stepped out of the spotlight, relocated to Hawaii and set about creating what was to become My Beautiful Dark Twisted Fantasy. Fantasy, in its sprawling, no-stone-unturned scope, its audacity, its braveness, its sheer magnitude, comes across as the work of a man with nothing to lose. The work of a man who threw every last ounce of himself into something, creating in the process not only his defining work but a work which redefines the genre in which it stands, as well as the benchmark for the concept of the album in general. There have been several great albums where artists have bared their soul – stripped themselves naked and given up everything for the sake of their art – and Fantasy stands toe-to-toe with every last one of them. It is a work of quite unique brilliance, an album that puts West's peers so far in the shade that they might as well not be there at all. As any follower of his recent G.O.O.D. Friday series might have worked out, the roll-call of guests on Fantasy is stupendous. To mention a few: Jay-Z, John Legend, La Roux, Elton John, Pusha T, Bon Iver, Rick Ross, Swizz Beatz, The RZA, Nicki Minaj, Raekwon, Kid Cudi, Rihanna, Alicia Keys, Fergie, The-Dream, Charlie Wilson and Chris Rock. It's to West's credit, though, that none of these talents, not to mention their roaring egos, overshadow an album that is very much the work of one man. As stellar as some of the contributions are, and there is some fine work here, they are very much guests in Kanye's world. Nicki Minaj tops a fine year (mostly through guest-spots and not through a slightly disappointing album, it must be said) with a blistering, typically demented verse-of-the-year contender on the speaker-rattling, thoroughly old-school party jam 'Monster', no mean feat when the same track features an unhinged contribution from Rick Ross, a man who, it seems, exists entirely on his own planet these days. Bon Iver's Justin Vernon becomes a brilliantly unlikely foil to West on several tracks, anchoring some of the more grandiose moments with perfectly orchestrated, heavily auto-tuned restraint. His falsetto, right up at its in-the-red peak, bookends 'Monster' nicely, but it's his reprisal of a vocal from last year's 'Blood Bank' on the outstanding, heartbreaking 'Lost in the World' which works best – segueing into Gil Scott-Heron's 'Comment #1', Vernon's other-worldly voice becomes the blanket in which West's demons are wrapped, the aural representation of a man casting bad spirits behind and rising onwards and upwards towards greater things. A contribution which at first raised more than a few eyebrows, Vernon's presence here feels essential: it's a beautiful moment, and one expertly judged. It's the album in microcosm, in fact: small moments underpinning much grander ones; the foundations on which something great is laid. It's an immensely satisfying album, a work of multiple layers, each listen throwing up a new line or a pitch-perfect sample (the use of King Crimson's '21st Century Schizoid Man' on 'Power' for example, or the Aphex Twin sample on 'Blame Game') to deconstruct. Its hit count and sheer creativity (see the epic, accompanying mega-video Runaway for confirmation), too, are staggering. That West has left off the likes of 'Mama's Boyfriend' and the fantastic, Beyonce-featuring, early-Kanye sounding 'See Me Now' (both readily available online) speaks for itself. Listening to Fantasy is a gratifying experience: it's obviously an album of immense endeavour, but it never feels like a slog. Indeed, it feels and sounds much like it must have been to make: joyous, liberating, revelatory – a new standard bearer for a genre in danger of becoming stale (albeit one which had a fine 2010, thanks in major part to this and Big Boi's outstanding Sir Lucious Left Foot). It's all the more remarkable given the troubles the album has risen out of. West's recent obsession with phoenix mythology might seem like a lumpen, dead-handed metaphor but this is a rise to new peaks, and one which firmly leaves the ghosts of the past far behind. One gets the sense that with this West is finally comfortable opening up that dichotomy between the man and the myth. Sure, he's still self-aggrandising and hyperbolic, but, for all the bluster that surrounds him, Fantasy is an album of immense humility. It's a deeply human record – open, self aware, revelling in its creators' myriad contradictions. There has been no man in recent memory who has bared his soul so publicly as West has in recent years (be it through awards shows, blog posts, twitter rants or chat show sofas) and there's a definite element of catharsis at play throughout the album. There are times when it seems that West's most hated figure is himself: the "the plan was to drink until the pain was over" line on the opening 'Dark Fantasy', the heartbroken, plaintive musings on 'Runaway', or the biting, self-mocking verses that run throughout 'Monster' all point to a man unsure of his place in the world, looking for a love that's always eluding him. Whether or not he'll ever find his place, what West has achieved right here and now with Fantasy is nothing short of remarkable: it's an album which not only firmly cements his place in the rap pantheon, but one on which he has overcome his ego, his doubts, his loves and his losses to create a work which will live long in the memory and which, crucially, once again brims with life. It's a record simmering with musical flair, the sound of man once more embracing the spotlight with open arms. It's nothing less than a gargantuan success, a maniacally inspired work of both bravado and humility – a portrait of vanity, pathos, love and rebirth bought to life as only West knows how. It's a record of towering ambition pulled off with what seems like outrageous ease. God knows how he'll ever top this, but if West were to retire now his legacy would be assured. Poignant, maximalist to the point of ridiculousness, and deeply fascinating, Fantasy goes to show that there's one subject Kanye West knows better than any other: himself.